Above: Smoking Cathedral Rock, viewed from the south. I’ve been taking a few days off to work on another project. I’ll be posting something new here eventually. 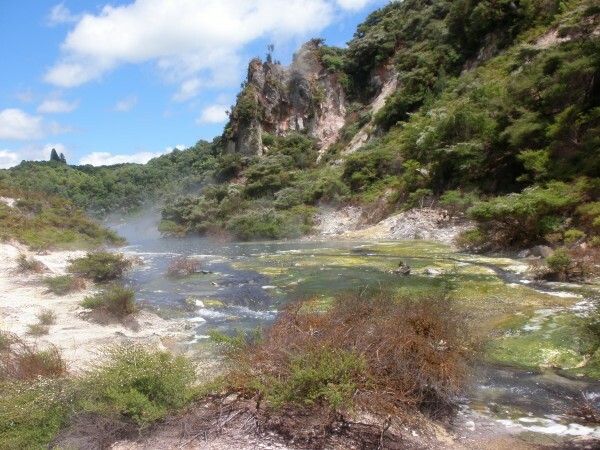 In the meantime, enjoy this music video I made featuring the Waimangu Volcanic Valley, a truly spectacular place about three hours southeast of Auckland. I plan to write more about our visit there because it really was one of the most beautiful places Jacquie and I had ever seen. Above: One of a few silicate deposit terraces. The music sounds a lot better listened to with earbuds. Out of respect to the reader, I won’t subject you to my Garageband/I-Movie- based music videos anymore.